Tattoos have always been common on the arms, chest, back, ankles and the legs. However today men are also getting finger tattoos for various reasons. 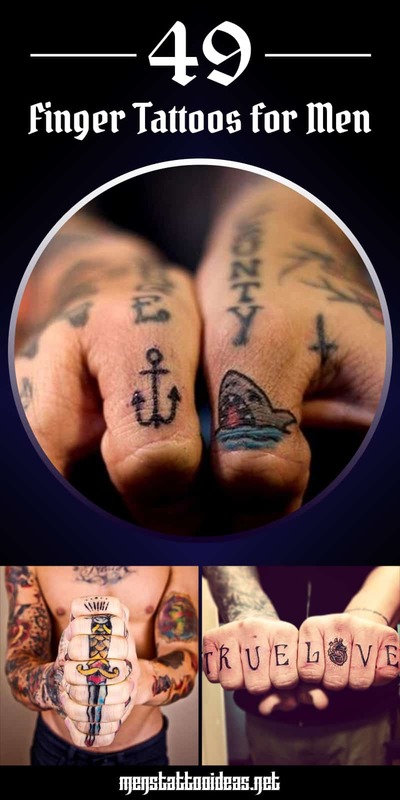 It’s up to you to decide if you want to have a tattoo on only one finger or a few fingers. Of the five fingers, the middle and ring finger are the most favorite among men. First and foremost, if you want a tattoo which is easily hidden or not easily seen, then your finger sides is the best place to have one. Remember, while tattoos are ‘hot’ when you are young, ten years later, your future employers may not approve it. So having a finger tattoo is a safe bet as it’s not easily seen and can be easily covered by clothing. They are however so small, that they can be even overlooked and is a cool way to start wearing tattoos. 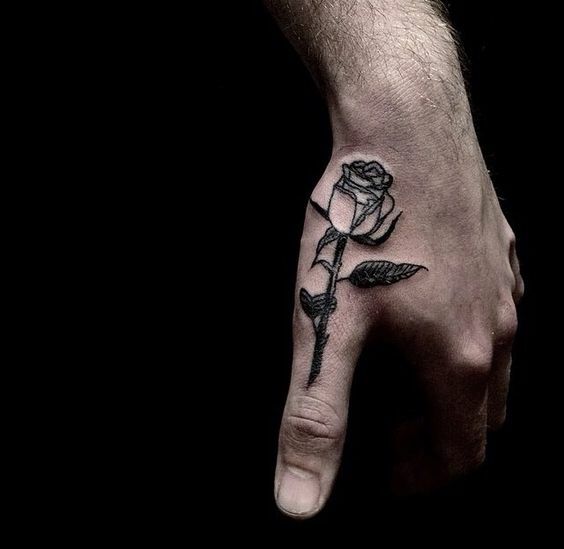 Besides tattoos on the finger sides, there are also finger tattoos for men near the knuckle, covering part or the entire finger. Finger tattoos come in various sizes, symbols and typography. They are also popular amongst couples as they get the ring designs to replace their engagement rings. They may also get similar designs on their fingers to show their connection, love and affection. There are finger tattoos of sword or a medieval knife which men like to wear. Some examples are bows, arrows and swords depicting their love for adventure and the medieval ages. Other popular tattoo designs for fingers are Celtic designs and skulls. Some men wear quotes saying things about their personality as their finger tattoo. It can also provide some motivation to encourage himself every day. Popular quotes for fingers are ‘Hope’ and ‘Don’t surrender’. Moustache tattoos are popular finger tattoos for men. It lets them give funny poses and is also a cool entertaining idea with friends. Ring tattoos are especially popular finger tattoos as they look like real rings but there’s no worry of ever losing or having them stolen. It also serves as a reminder of a special person, event, place or thing that took place in their lives. The Buddha is another popular finger tattoo as it indicates the presence of a positive power in his life. Some men have their wife’s name carved on his ring finger indicating his love and commitment to her and their marriage. Black or dark blue are better colors. The problem with finger tattoos is that they tend to blur or fade away quickly. This is because we are constantly doing something with our hands throughout the day and hands are constantly washed. This is why it’s better to wear tattoos with black and dark blue colors as they don’t fade as quickly as other colors. Moreover, fingers are thinner when compared to other body tattoos and thus may not hold pigments well. So there are no fixed ideas to use as finger tattoos for men. It’s up to you to choose and wear the design which best depicts your ideal in life or whatever special there may be in your life. 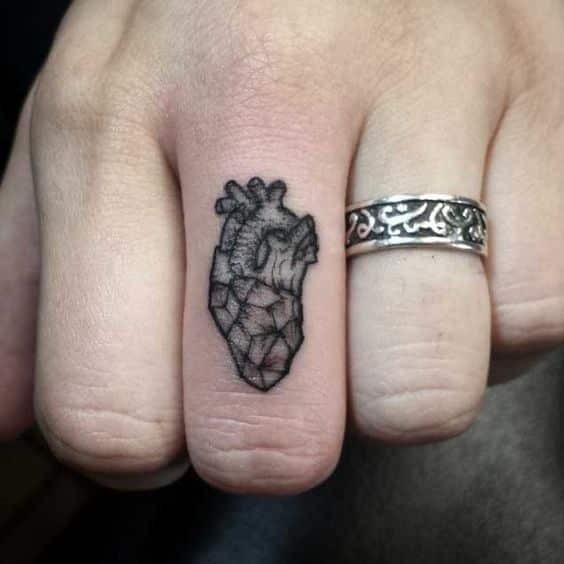 This is one of the finger tattoos that is classy and unique. The rose might symbolize sorrow and death, or it could be a long-lasting hope. It looks elegant on the thumb as it stretches downwards. It is also big enough for easier visibility. The heart applied on the middle finger is most likely linked to love. The bottom part of the heart has some classy diamond patterns for elegance and extra uniqueness. Since the heart is slightly big, it shouldn’t have a ring worn over it. 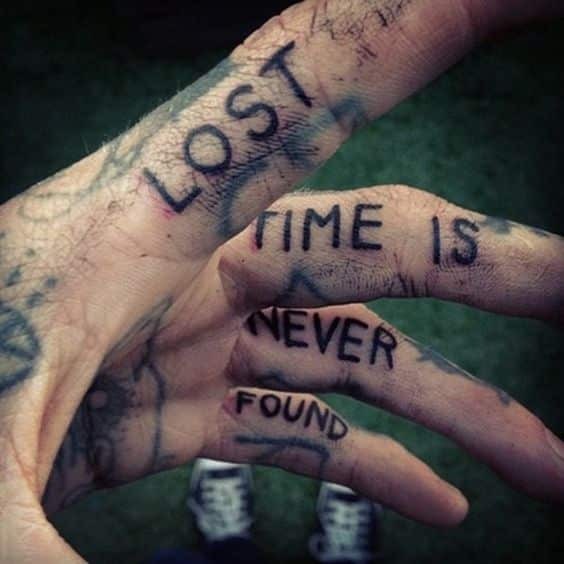 The message presented in these fingers focus mostly on time management. It could be used as an encouragement to the wearer. Each word is applied to the side of the finger, and they can be visible when you spread the fingers. 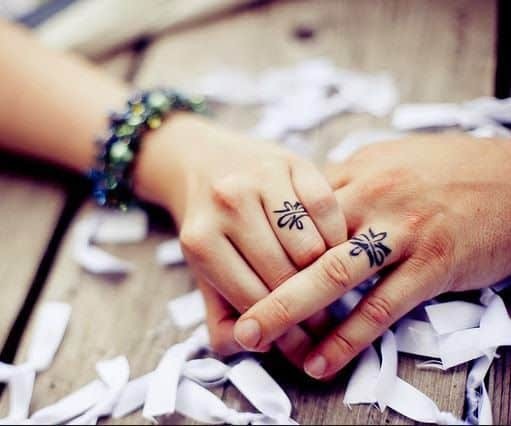 This finger tattoo matches that of the lady, and they are both applied to the wedding ring finger. This one is for a man together with his partner. It could be a replacement of the regular wedding ring since it is permanent. 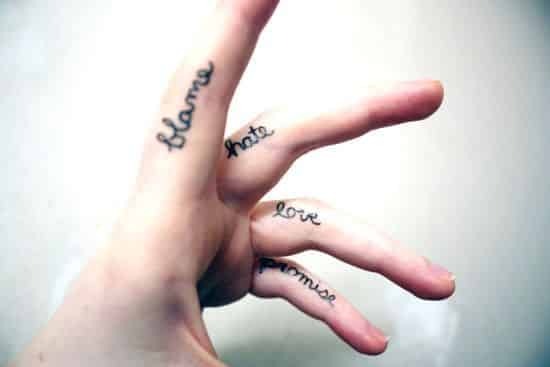 This is one of the finger tattoo ideas that is stylish and has a deep meaning. 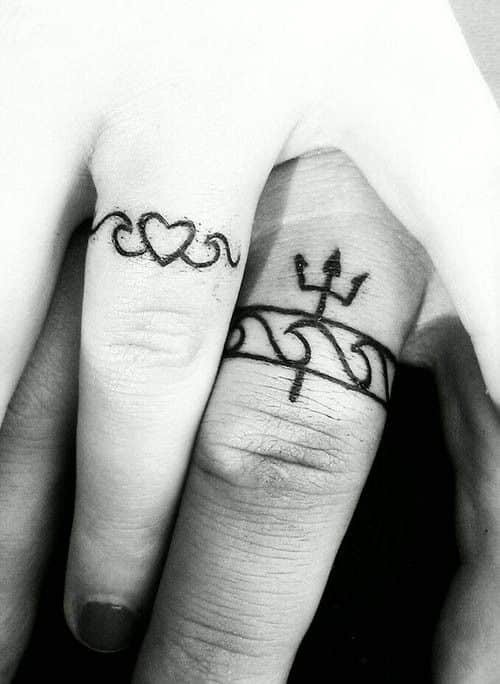 The design of the tattoo on the man’s ring finger denotes a permanent ring, which matches the heart rate tattoo on the lady’s finger. 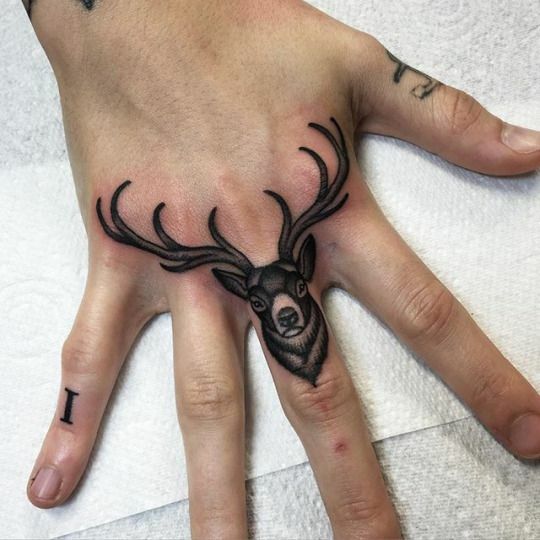 The male deer tattoo on the finger is classy and looks stunning. The head goes down to the middle finger while the horns spread around the back of the hand. Even though the deer symbolizes rebirth, love, peace, or intelligence, it could also be a natural love for nature. 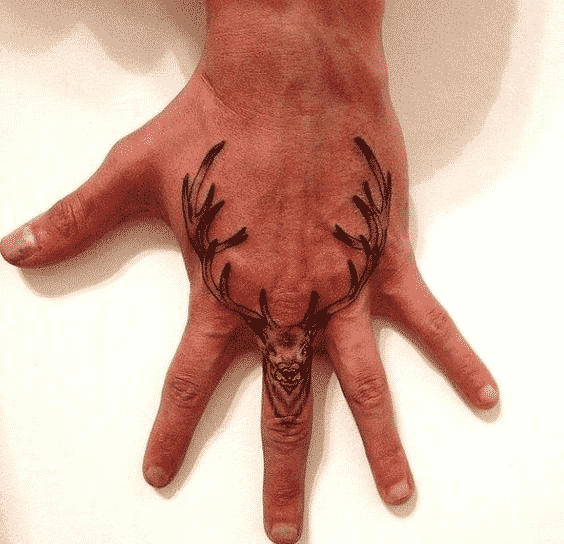 This is another finger tattoo design that has a deer that has fewer 3D effects. The black ink is not very much concentrated. While the head of the deer fills the lower section of the middle finger, the horns stretch over the back of the hand. 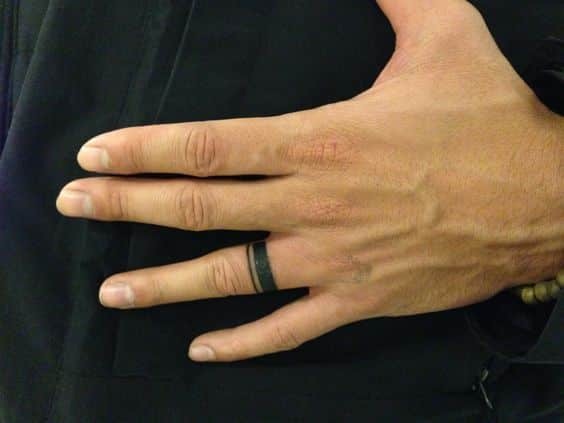 This ring tattoo on the finger might seem basic, but it could be used as a replacement of the standard wedding ring. With this tattoo, there will be no chances of losing it or fading like the regular rings. 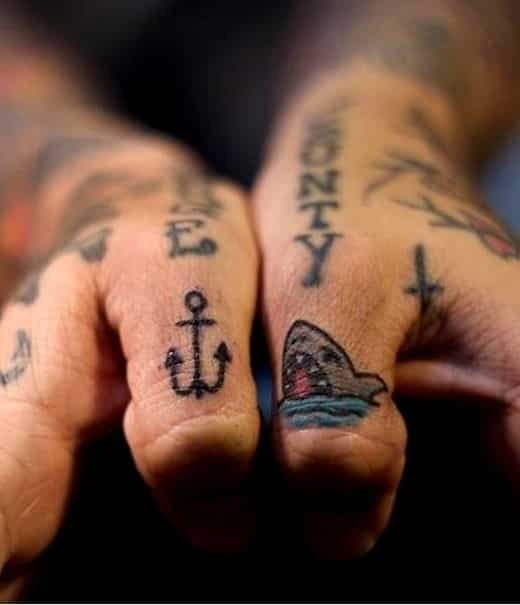 The anchor and shark applied on both thumbs make this tattoo have an elegant display. The anchor could symbolize security or support while the shark symbolizes dominance and power. The combination of the two makes it have a strong meaning. The words on the guy’s finger are applied with some elegant taste of calligraphy. They appear simple but carry a deep meaning. This way, you can flash the words to for the public to see and broadcast out your message to them.